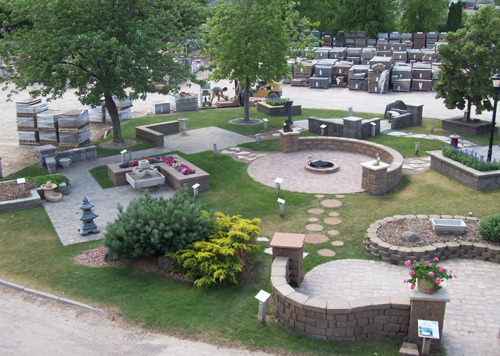 Welcome to Patio Town, your preferred source for retaining walls, pavers, landscape rock, patio furniture, barbecue grills, and other landscaping and outdoor-living supplies in the Minneapolis-St. Paul metropolitan area. Founders Peter and Sharon Blomquist established the first Patio Town Store in 1965 in North St. Paul, Minnesota. The store later relocated a short distance to Oakdale, Minnesota. It was the first retail business in the Twin Cites that sold rock, pavers and retaining walls to homeowners. It quickly established itself as the premier retail outlet for landscaping supplies and hard goods. In 1975, a second Patio Town store opened in Burnsville, Minnesota, and a third location opened in Brooklyn Park, Minnesota, in 2001. In addition to landscape materials, Patio Town offers a range of other services to help you transform your outdoor environment into the yard of your dreams. Whether you're adding mulch or decorative rock around your house, replacing concrete or asphalt with a paver patio, sidewalk or driveway, or taking out a timber wall to install a freestanding, gravity or reinforced segmental retaining wall, Patio Town's expert staff is waiting to serve you. Patio Town is also your preferred source for outdoor furniture and grills. Our exclusive line of Comfort Craft outdoor furniture will not chip, crack or splinter; features stainless steel fasteners; never needs painting, staining or storage--and is made in the USA! For the outdoor chef we carry Napoleon Gourmet Grills and a complete line of grilling accessories. Patio Town offers a full schedule of do-it-yourself seminars during the landscaping season. You can learn how to install retaining walls or how to install paver patios, sidewalks and driveways from our expert staff. Our landscape design/build group, Villa Landscapes, has a full staff of landscape designers and installers for those who need professional help with their projects. Patio Town has been proud to serve the following Minnesota and Wisconsin communities for more than 50 years!